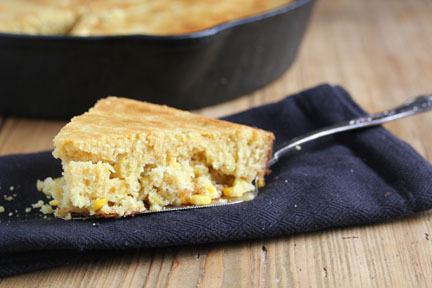 I don’t know about you, but for me…cornbread is such a comfort food. It’s warmth, it’s texture, it’s taste remind me of home and family. Slathered in a rich butter, dipped into a bowl of your favorite chili, chopped up for a scrumptious holiday stuffing. In a mixing bowl or stand mixer, beat together the butter, yogurt, eggs and brown sugar. Add the cornmeal, flour, soda and salt. Mix until batter forms. In a cast iron skillet (or other ovenproof 10″-ish skillet), add the olive oil and heat over high heat. Add in the frozen corn and brown sugar and saute for about 5 minutes. Pour the batter over top of the sauteed corn and stir the corn into the batter. Immediately place the skillet into the preheated oven. Bake for 30-35 minutes, or until the top begins to golden and a toothpick comes out clean. Let cool slightly before serving. Serve warm with butter and your other favorite comfort foods. 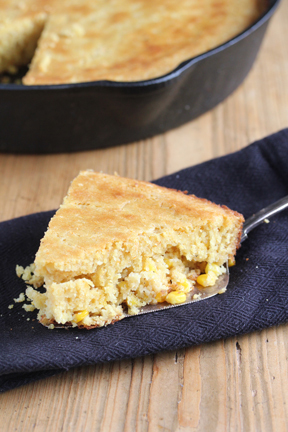 What’s your favorite way to make cornbread and your favorite cornbread recipe!? Ahh, I’m sure it tastes just as good as it looks! It’s so refreshing to see a blog entry cornbread that isn’t related to stuffing during Thanksgiving. Though I can’t think of my favorite cornbread recipe off the top of my head, all of this cornbread talk reminds me of a great little barbecue joint in Venica, California called Baby Blue’s. 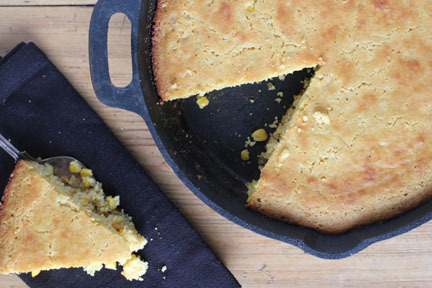 The place certainly knows its cornbread — it has the same texture as cake! I’ll have to try your recipe out next time I make some Southwestern fare. Cornbread is one of my great loves. I’ve had to go dairy free this year, and I just can’t get it right without the dairy. (the alternative milks give it a funny aftertaste–and I’m going for savory, not sweet, and no where near cake-like cornbread) I’ve resorted to mostly eating what we called lace cakes growing up–hot water cornbread fried in a skillet. It’s more trouble than regular, but it tastes pretty darn good. try coconut milk. that seemed to really work for me. We too are gf, and being southern, love cornbread. We have found that we prefer to use NO gf flour in our cornbread, only corn meal and corn flour, and the taste and consistency are fab, with real butter soaking into it! I use a similar recipe, but have usually baked it in muffin pans. I am going to guess that the skillet in the oven produces a browned, crispy crust? Sounds like a plan to me! On a side note, my 16 yo was at a friend’s for dinner a while back, and was served cornbread made from a mix. He didn’t like it much – it didn’t have “any” corn in it.